Once again, thank-you to everyone who left me such lovely comments! They're very much appreciated. Yesterday, Mum and I went out to get her tyres replaced. I can't say that was a particularly thrilling experience! However, when I got home, I baked a quiche. It was very yummy, even though it had nearly an entire block of butter in it!! Cheese and Onion Quiche: Made by yours truly! I swear, it tasted a lot better than it looks. Today, I spent the day in town with one of my lovely friends, Stef. We had intended to go to the cinema to see Samson and Delilah, but we preferred the idea of wandering about and chatting. So, that's what we did! When Stef and I were wandering through the Art Gallery, a lady stopped me and said: ‘I hope you’re not offended by this but you look like you’ve just stepped out of one of these paintings!’ Oh my, I thought, what a lovely compliment! It’s just as lovely as when one of my lecturers told me she always looked forward to seeing what I would be wearing next and that I was like a living piece of art, myself. By golly, some people are nice, aren't they? I had intended to only spend money on things I needed - hairspray, blush, etc. - but I came home with a new make-up case and a dress. It was very naughty of me! 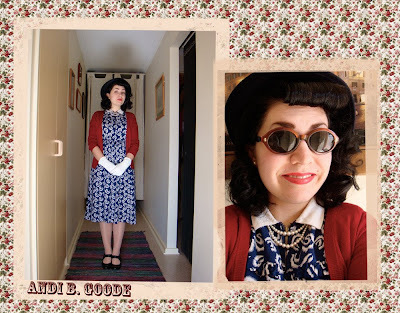 Dress: 1930s/40s Rayon dress. 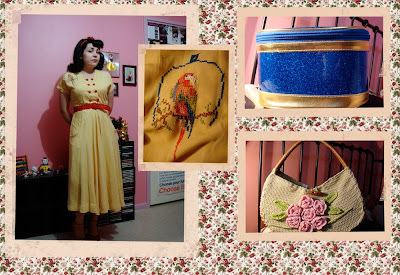 I bought this from Red Ruby Vintage - I'd seen it a few weeks ago, I think, and it's been on my mind since then. So, I went in today, thinking 'At least try it on!' and, gosh, aren't they famous last words? Gale told me another girl had tried it on the other day and bought 3 or 4 dresses but put this one back. To me, that was a sign! I tried it on and it fit me perfectly so I knew that it had to be mine. It was 130$ but I got it for 100$! Not a bargain, really, but, oh my, that dress is wonderful! And I love the detail of the cross-stitch Rosella on the shoulder. Also, there's something very Snow White about this dress. I just need a blue bolero or cardigan! Make-Up Case: Look how shiny it is!! Not vintage, but isn't it pretty? And only 10$, too! Bag: Not vintage, either, but it has a vintage-y feel to it. 10$ I actually bought this yesterday, when Mum and I were waiting for her tyres to be fixed. When I got home a package containing this and this was waiting for me! The little black hat is going to be put away until Christmas (Mum bought it for me), but the navy hat is all mine, right now! It looks quite nice on, too. I was very happy. I've vowed to stay away from vintage shops for the next few weeks, though, in hopes of mending the hole in my bank account. Will I stay away? Only time will tell. everything is suber, love you in the yellow dress. Miss Matilda: Thank-you! =D I'm so very much in love with that dress! Oh Andi how wonderful is that yellow dress! What a find. Everything else is wonderful too, you always look so smashing. My goodness you are fabulous! Your style is too stunning for words! I mean it sincerely when I say you're my new vintage fashion muse. Have a stellar day, honey! You are just adorable! 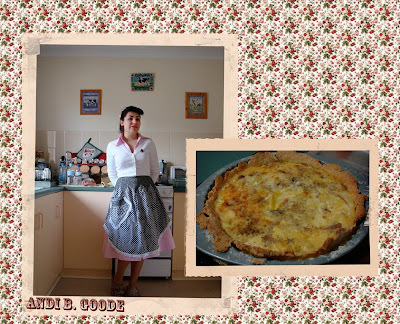 I baked a quiche today too! It was a crab, red, peeper, and spring onion one! Scrummy! Andi... I didn't realise that you where the same Andi from QoV forum and I found your blog a few days ago and now just figured out who you are. Love the blog, keep it going. I get really snowhite-y vibies from you in that yeallow dres! nice. I think it suits you! Live it up and love it up, amigo!